Treehouses are big news at the moment – from the Virgin Holidays safari treehouse that’s popped up on the South Bank in London to the luxury treehouse hotel suite that YouTube star Zoella stayed in, these treetop escapes are the ultimate getaways right now! This week, London commuters were greeted with the sight of a towering pop-up treehouse built in a Safari style on the South Bank. The treehouse is part of a PR campaign by Virgin Holidays to promote their Lion Sands treehouses in South Africa at a time when most people start thinking about their summer holidays. The 35-foot high structure has been decorated with African prints and tribal sculptures to create a safari style designed by Hubert Zandberg, a South African interior designer based in London. 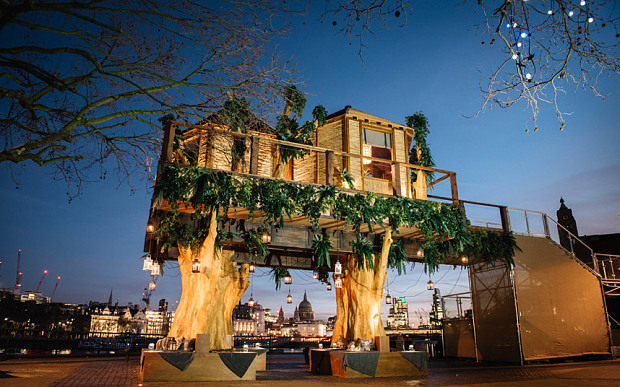 Complete with a four-post double bed, flat screen TV and private balcony with views over the Thames and St. Pauls, the treehouse offers a truly unique urban safari experience. A journalist and a blogger were selected to spend a night each and enjoy a six-course safari feast (featuring mealworms, crocodile and ostrich meat) cooked by 2013 Masterchef quarter finalist Petrus Madutlela. On the third night, one lucky member of the public was selected from a prize draw to enjoy the city treehouse experience. Tongole Wilderness Lodge built by Blue Forest in Malawi. 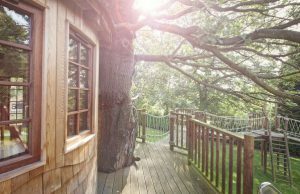 Treehouses have come a long way from the planks of wood that your Dad put up in an apple tree for you – they’ve still got that sense of excitement and adventure, but now they also come with en-suite bathrooms and hot tubs. The infamous treehouse suites built in the grounds of Chewton Glen hotel in the New Forest – known for being the final destination of Chris Evan’s Dirty Dozen charity event – are truly beautiful lilly-pad shaped structures and celebrities and VIP’s alike are clamouring over themselves to book a stay there. When Zoe Sugg (aka YouTube v-logger Zoella) booked a surprise treehouse weekend there for boyfriend Alfie, the video had just under 2 million views and her loyal followers were beside themselves with excitement. ‘The treehouse looks so luxurious and gorgeous! I’d love to go someday!’ one girl wrote. ‘This post has totally inspired my next trip; I am definitely going to look into this place!’ said another. hotel Chewton Glen based in the New Forest. Blue Forest have established a reputation as the world’s leading designers of luxury treehouses and eco-lodges and have a passion for creating imaginative and adventurous designs that bring people closer to the natural world. 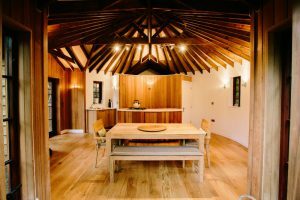 We pride ourselves on our highly skilled team, including architectural designers, interior designers and project managers and on the network of craftspeople, engineers, suppliers and manufactures who work with us to ensure our treehouse designs are at the forefront of sustainable luxury design. “Tree House Designer” – Would It Be Your Dream Job?